Excitement bubbled up within me. I’m an evangelist and this conversation was near and dear to my heart. However, I got too excited. My explanation of the gospel was clear as mud. I left my friend more confused than satisfied. Other people may have a paralyzing fear when they are asked a simple question like that. In my evangelism training workshops I will often ask people to share the gospel one with another. In that little command, the tension in the room rises high. People stare at me like I just broadsided them. But they turn to their neighbor and try to explain the gospel. The general response: Confusion, panic, freaking out, because they suddenly realize that they can’t wing it. For years, they thought they could explain the gospel but given a moment (even in a workshop) to do so, they stumble over their own words and realize they don’t know how. 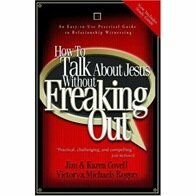 Share Jesus without Freaking Out. Let me give you some principles that can help you. 1. Make sure that your relationship with God is going well. Fast as you seek God’s direction. 2. Practice kindness to others you encounter in your daily life. Take the time to notice people around you and be aware of the people you run into while “on your way.” Read The Art of Noticing People. Take the time to learn the stories of the people you want to talk to about Jesus. Use Questions. Read What is the Question Behind the Question? Ask them questions about their lives and listen actively as they talk. Show genuine interest in them as people. After you learn about others, tell them about your life. Then share the story of how and why you began a relationship with Christ and how that relationship has made a difference in your life. You may want to outline your personal testimony, then edit into text that will take you only about three minutes to present. trust Jesus to connect them to God. Try to present the gospel as clearly as possible, giving people enough information to enable them to make informed choices when they respond. Using Gospel Scripts is helpful. What are some tips that you have found helpful in being able to talk about your faith and the gospel clearly and simply, without freaking out? Share with us.